Do you see it, right there? That’s the problem. Herein it shall be explained why and then how it is solved. 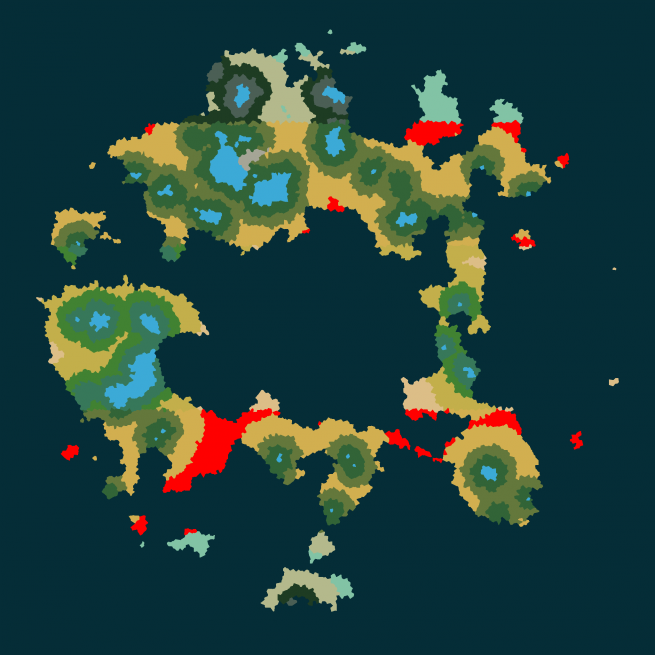 So we’ve had some talk about the overworld lately and the old post about world map generation still stands. 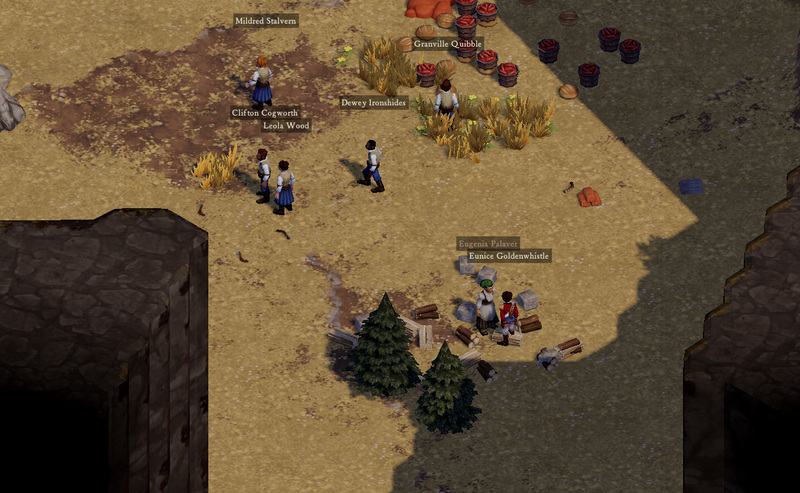 Now we’re dealing with the details of living in it, of filling each biome with appropriate textures and objects. This is proceeding rapidly. So what’s that red stuff? It’s nothing. In other words, it is a part of the map for which there is no applicable biome. The map tracks moisture and temperature (among other things) on a scale of 0 to 8. 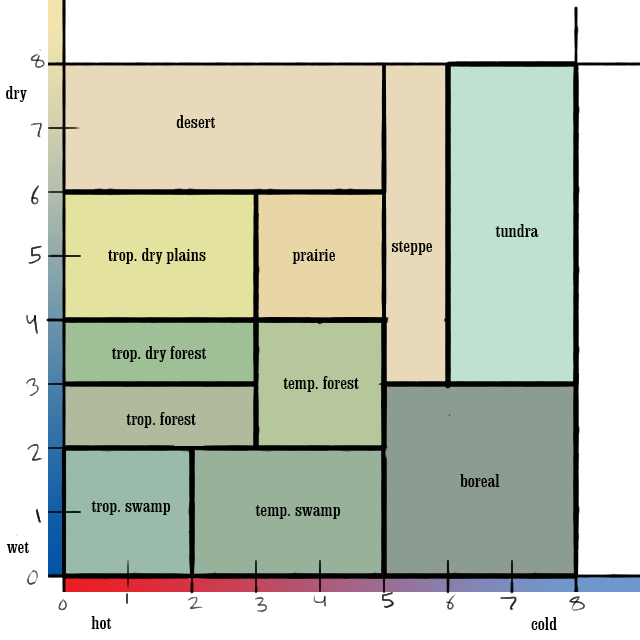 We can create a two axis chart of this and draw rectangles that describe the range of conditions in which a biome will appear. In the real world, this results in those fascinating charts I’m sure you’ve seen, for example down a bit on the wikipedia page for biomes – direct image link here. Which has no red, no gaps in reality, no problems! … well, plenty of problems, but you’ll see those later. Dramatic, yes, but actually terrible. This was not a missing biome, but a missing sub-biome. This is the collection of data which defines what appears in-game on-map. 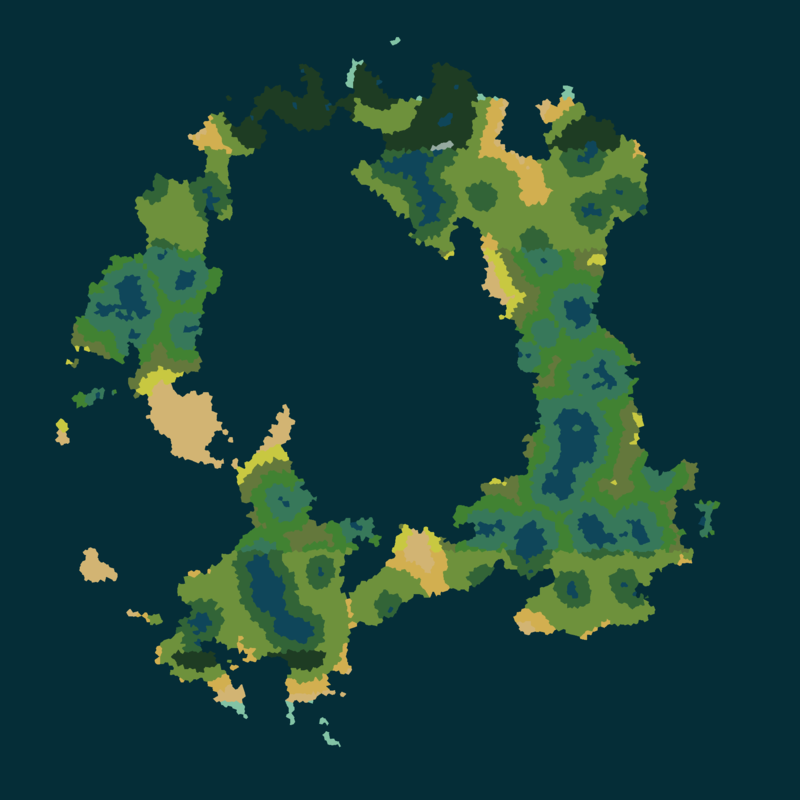 Every biome has a collection of sub-biomes. Savanna (uh, “tropical dry plains” in the charts above), for example has sub-biomes called “savanna grassland”, “savanna forest”, and “savanna watering hole” which are used in various proportions to fill in any bits on the game map that are considered savanna. So in the mountains of madness examples above, there was a typo so the sub-biome wasn’t found. 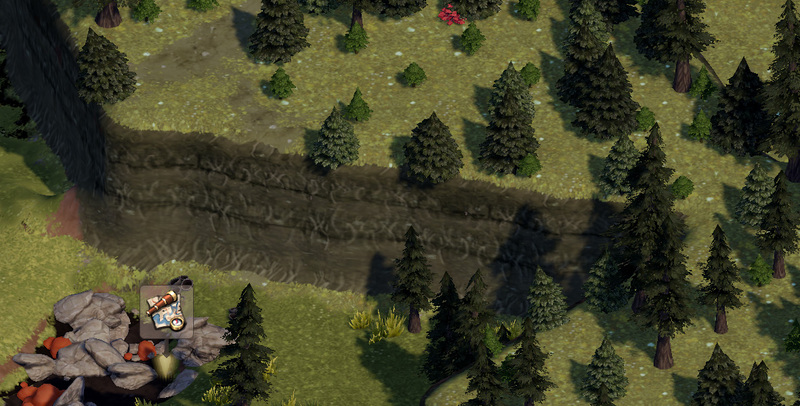 This caused the map generator to default to setting any area of that sub-biome to be made up of rock at the max map height. Easy fix! The lesson? It doesn’t hurt to chart your data. 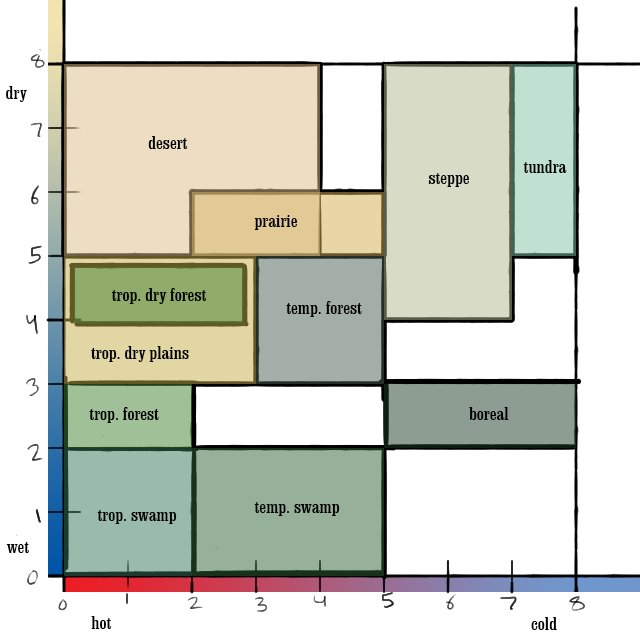 Posted in Clockwork Empires	| Tagged abrupt desert biome transitions, biomes, i love biome charts, more biomes, the mountains of madness is an important biome, what's your favourite biome classification system - Whittaker Walter or Bailey? Please vote in comments thread. Eagerly awaiting when I can start in the deep tundra and then get upset when everyone dies. But then the chart will be in 3 dimensions. Do tentacletree spawn in wet and hot evil biomes or rather in cold and dry evil biomes S? I associate tentacles with wet and hot….. but that could be because of swamps in Don’t Starve. I want to settle in nothing! Whittaker-Walker 4EVAH. Bailey is a soulless hack who does not UNDERSTAND the joys of the temperate rainforest and seeks to DESTROY THE ENVIRONMENT through classification. Fie I say! A pox on his house!